The Air Bed Replacement Chambers for our Adjustable Air Beds offer the best features. The genuine European design of the Vulcanized Latex/Canvas Air Bed Chambers provide a 5.5-inch full cut depth for exceptional adjustability, comfort, and maximum sleep satisfaction. 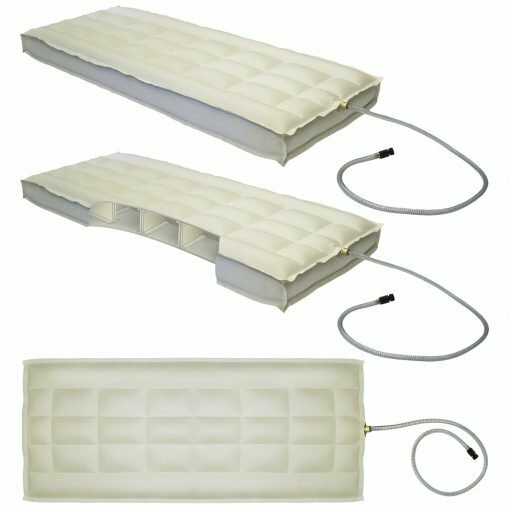 The Air Bed Chambers are made with natural cotton bonded to the natural latex that offers a soft texture and eliminate leakage of air. Unlike national competitors that use a thinner gauge of rubber (e.g. 24 gauge) or PVC plastic, our air bed chambers are made with ultra thick, 25 gauge vulcanized latex. 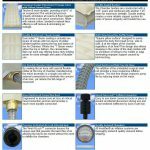 The air chamber borders are double-sealed (1.2″ seam reinforced with another 1.25″ seam) for extra strength, and provide the chambers with an extra long life. Competitors use the lap seam construction design, which is less durable. While other competitors use the “C” Beam construction, which offers only one side sealing, the double-reinforced “I” Beam construction of our air bed chambers consists of 2 layers of canvas bonded together with 2 layers of rubber joining the top and bottom of the air chamber. Where the “I” Beam meets the top and bottom, the canvas/latex flairs out each way and provides twice the holding power for ultimate strength and extra years of durable use. Our air bed chambers offer the “Square Pillow Surface” or multi-directional Box Baffle Design instead of the competitor’s single channel seams. The Box Baffle design provides even and multi-directional air flow for head-to-toe, side-to-side and at the edge support for the body. The design also eliminates the typical hammock or cupping effect of the competitor’s air chambers (competing designs have horizontal air flow). The Box Baffle design reduces pressure points and adds to your comfort for that great night’s “floating on air” restorative sleep. 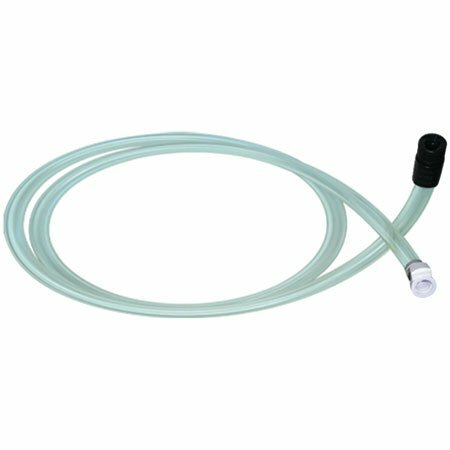 The Uni-bonded air chamber inflator hose is sealed with special flexible rubber at the time of the air chamber manufacture. And unlike the competitors, who use a plastic clip attachment, our hose is a single unit with no external connections eliminating the concern of air loss. Competitors use thin PVC tubing which is susceptible to kinking. Our inflator hose is steel-reinforced and kink-free, which improves pump life and offers precise adjustment. The connection boot is brass-reinforced and is engineered to assure zero loss of air at the critical hose/connection juncture. Our brass-reinforced connection boot is much more durable than our competitors, who use an non-reinforced plastic fitting. The Barrel Cam-Lock Inflator Connector Adaptor twists and locks in place onto the following Air Inflator Pumps: Digital Ultra Air Power Plus, Adjust-A-Rest Super Quiet, Digital Air Deluxe, and Eclipse. The Twist-N-Lock design prevents an accidental disconnect during use, and creates an air-tight, trouble-free seal. An internal pressure valve allows the chamber to be easily disconnected from the inflator pump without the need to deflate the air chambers. 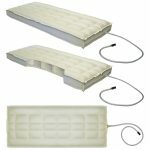 Note: Our replacement vulcanized latex air bed replacement chambers will fit or adapt to any of the popular air beds such as Sleep Number/Select Comfort, Boyd Night Air, Comfortaire, Comfort Craft, Luxury Support, and Strata Halycon mid-fill (6-inch) soft-side adjustable air bed mattress. 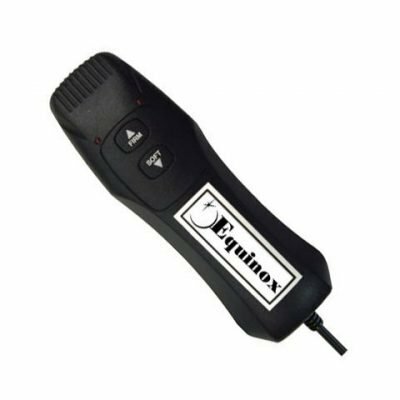 The chambers are compatible with the Adjust-A-Rest, Luxury Support and Eclipse/Equinox air pumps. If you have any other brand of pump, please send an email to: www.info@premiumadjustablebeds.com with photos of the connection to your existing pump and the connectors from your existing air chamber hoses. 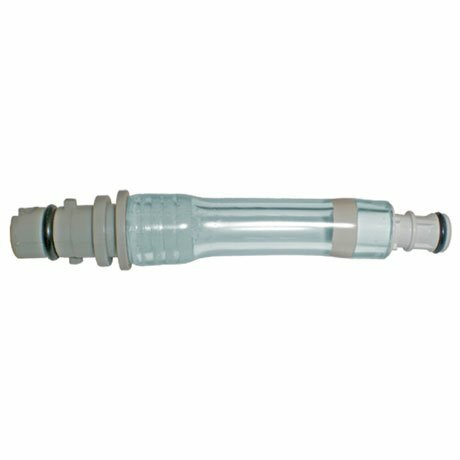 We have several connectors that would facilitate connection of our air chambers to your existing pump. All has gone well and we are happy with the dual air chambers. You don’t feel any movement in the bed when one person gets in or out or rolls over. The mattress feels very much like the water bed, but without the waves. You were very helpful to us and we appreciate it.